The Celebration of the MostHoly Mother of God, in honour of Her "Kazansk" Icon, was established in gratitude for the deliverance of Moscow and all Russia from the incursion of the Polish in 1612. The period of the end of the XVI and beginning XVII Centuries is known in the history of Russia as "the Time of Troubles" ("Smutnoe Vremya"). The country suffered the onslaught of Polish armies, which scoffed at the Orthodox faith, in plundering and burning churches, cities and villages. By way of deceit they succeeded in taking Moscow. To the appeal of His Holiness Patriarch Ermogen (Comm. 12 May), the Russian nation rose up in defense of its native-land. To the militia forces headed by prince Dimitrii Mikhailovich Pozharsky was sent from Kazan the wonderworking image of the Mother of God. Sainted Dimitrii of Rostov (Comm. 21 September), in his "Discourse on the Day of Appearance of the Icon of the Mother of God at Kazan" (Icon feastday 8 July), said: "The Mother of God doth deliver from misfortune and woe not only the righteous, but also sinners, but which sinners? Those, which do turn themselves to the Heavenly Father like the Prodigal Son, they make lamentation beating their bosom, like the Publican, they weep at the feet of Christ, like the Sinful Woman washing His feet with her tears, and they offer forth confession of Him, like the Thief upon the Cross. Upon suchlike sinners is it that the All-Pure Mother of God doth heed and hasten to their aid, and from great misfortunes and woe doth deliver". Knowing that the misfortunes were in sufferance for their sins, the whole nation and the militia imposed upon themselves a three-day fast and with prayer they turned to the Lord and His All-Pure Mother for Heavenly help. The prayer was heard. Situated in captivity under the Polish, from Sainted Arsenii (afterwards Bishop of Suzdal') came an announcement, that in a vision to him had been revealed a shifting in the Judgement of God towards mercy, through the intercession of the MostHoly Virgin. Emboldened by the news, Russian forces on 22 October 1612 liberated Moscow from the Polish usurpers. 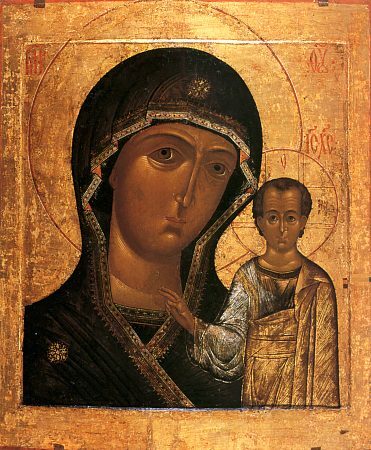 Celebration in honour of the Kazan Icon of the MostHoly Mother of God was established in 1649. And down to our own day this icon is especially revered by the Russian Orthodox nation.